A PoP Transaction has several stages in its life cycle. These are relative terms. Each individual block will be secured by a future block, will endorse previous blocks, and will payout PoP rewards for PoP miners who secured a previous block. 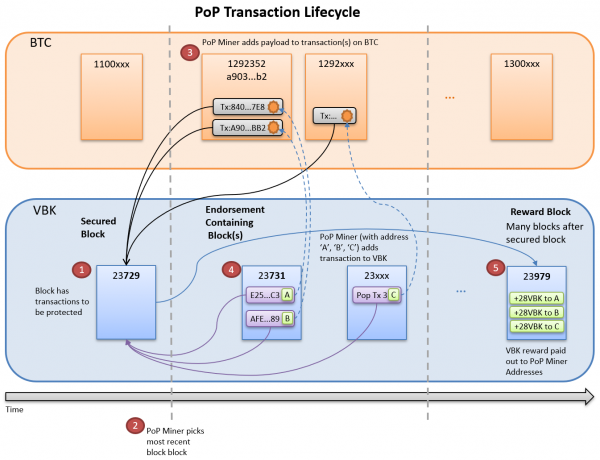 The PoP Miner picks that most recent block and aggregates its information into an 80-byte PoP Payload. The header will be the header of the “Secured Block” (say block #23729). The PoP Miner puts the payload in the OP_RETURN of a Bitcoin transaction. The PoP Miner creates a PoP Transaction that will be submitted to future VBK blocks (say block #23731). This transaction both points to the Bitcoin transaction and the prior secured block. 500 blocks after the secured block (#23979 - picture is outdated, and was back when it was 250... now it's 500), the reward will be paid out by the coinbase according to the PoP reward protocol. This will be shared amongst the miners.